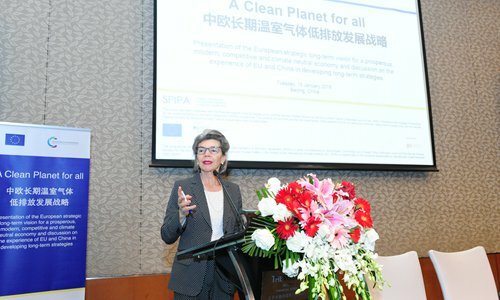 The EU Delegation and the Institute of Climate Change and Sustainable Development of Tsinghua University jointly hosted the public event on the EU Long-term Climate Strategy in Beijing on Tuesday, presenting EU's long-term climate strategy and also discussed the experience of the EU and China in developing long-term strategies. The event was led by European and Chinese experts who shared insights into the development of the EU's and China's long-term strategies, especially in the key sectors of energy, transport, industry and the role of land and agriculture. He Jiankun, chairman of the Academic Committee of the Institute of Climate Change and Sustainable Development at Tsinghua University; Megan Richards, director, Directorate-General for Energy, European Commission and Artur Runge-Metzger, director, Directorate-General of Climate Action, European Commission were present at the event.